I bought this green and gold necklace back in the Spring and to be honest hadn't worn it much because I was having a hard time figuring out what to pair it with and it is a tad on the short side (I think I may lengthen it with some chain I have though). When I was getting ready for work and deciding what jewelry to wear to spice up this plain tee I figured I'd give the emerald green necklace a try with emerald green and pink earrings and surprisingly it worked. I thought it wouldn't because who thinks to put mint and emerald green together but in such a small dose it looked great! 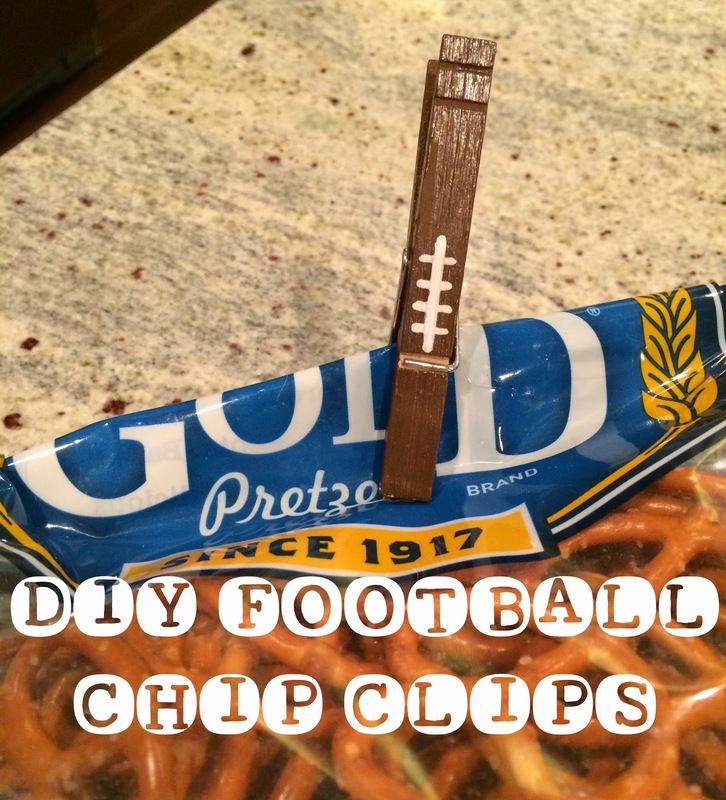 We stepped up our tailgating a little bit this year (more on that in another post) and I decided to make festive chip clips from clothespins. This is the easiest DIY ever and you could customize these clothespins so many different ways with team colors or let kids decorate them. I decided to stick with the classic football. Paint as many wood clothespins as you want. Mine came in a cheap pack at Walmart and I did 10 of them. I was able to paint 3 sides, let those dry and then paint the 4th side and the inside of the "V" part. Then I painted the football seams with a white paint pen doing one side, letting it dry and then doing the other side. We used these of course as clips for bags of chips, pretzels, etc. but we also used them for hanging up a banner and for clipping a cable up to the one of the tailgate tents so it wasn't running across the ground. So many uses! Another great football/tailgating DIY is the team burlap banner. Check out how to make one here. I've said it before and I'll say it again, I never used to stock my wardrobe with many blazers and jackets and once I started doing that, it really opened up so many possibilities for mixing and matching and creating great outfits. So with that said, always keep an eye out for ones you can add to yours! This gray 3/4 sleeve jacket is one I really love for work or casual... in this instance below it was worn to work. It is now officially Fall according to the calendar and I know everyone is busy busting out all the pumpkins, gourds and the rest of their fall decor. But it doesn't quite feel or look like fall yet here in Charlotte. It also doesn't seem like it is still summer either so I wanted to ease into fall decor with a transitional Fall Mantle. I'm holding off on bringing out all my pumpkins and such so for now I've made a few tweaks to what I had up for summer. I swapped out the yellow flowers in the vase for this mix of orange greenery/flowers and put out my "Fall" burlap banner instead of the "Shine" one. Oh and I feel like the globe can really be any season but it was a recent purchase (after lots of searching!) and I was ready to change out the LOVE sign and show off my vintage globe front and center to the left. Candles are the same as before. My mom helped me arrange the orange flowers and "greenery"... not sure what to call that stuff. We stuffed a few plastic grocery bags down in there to be able to manipulate the stems how we wanted to and not have them fall to the side where the vase is a little wider. Don't worry the pumpkins will be making an appearance in a few weeks! I always wanted to decorate above the kitchen cabinets at our first house and never really got around to it before we moved. So I recently started collecting items to go over our current kitchen cabinets. Since we have staggered kitchen cabinets (different heights), I decided to just put items on top of the cabinets with more space above them. Also I think a key to making above cabinet decor look great is to not put too much up there. So even if you don't have different heights, space items out into corners and groupings much like how you would decorate a credenza, buffet or dresser. I've felt like the tip of groups in odd numbers usually hold true for a great look... so items with 1, 3, 5, you get the idea. I gathered these items below from April through August. You can tell I like to decorate with varying textures too. The only thing that might be missing is some type of greenery but haven't figured out where/if I should add that. I did not want to overdo the decorations or have anything that drew a bunch of attention. Of course I may swap out a couple of things or add something just when I decorate for Christmas. For the cabinets to the left of the first photo, I first picked up this wooden farmers market sign at a vintage warehouse last Thanksgiving. I was trying to collect enough wood scraps to put under the items since there is a dip down on top of the cabinets of several inches where the molding is but was having a hard time with the sign falling over. My mom suggested using old magazines and catalogs and it worked like a charm. I could stack them behind the sign too to keep it tilted back ever so slightly so it didn't fall. As you can see pretty simple but a great way to add decor to your kitchen! And here is a picture of the whole kitchen so you can get an idea of the cabinets. In case you were wondering we have since raised the height of the pendant lights... who knows why the builder put them that low. I usually pair this bright yellow skirt with a neutral top or I've paired it with a bright blue before but I decided to try it out with my favorite color, teal. And I really liked the combo. If you like bright happy colors definitely try out yellow and teal together. As I've said before if you are shy about yellow (as many people are) try it as a bottom instead of a top and won't have a chance to not look great with your face skin tone. I only wish I could find this exact skirt in more colors. It is the perfect length and fit. I've found that one of the biggest beauty challenges for someone with fair skin is finding lipsticks that look great. 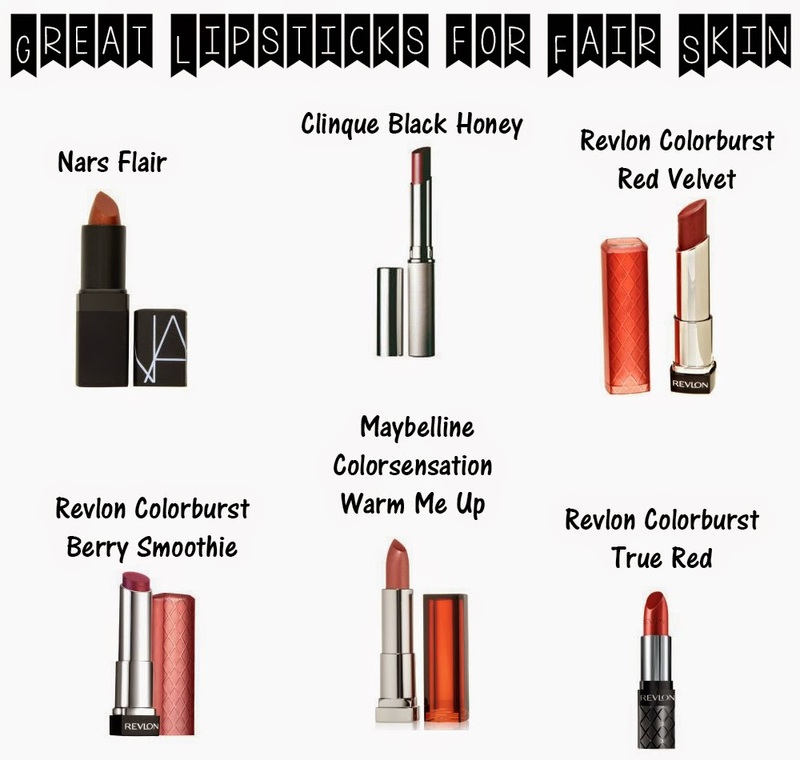 Of course there is no one lipstick for all occasions since if you are wearing colors that go better with red you will want a red-tone lipstick or wearing colors that go better with pink you will want a pink-tone lipstick and so on. I've compiled a list of lipsticks that I find to be fabulous for those with fair skin like myself and these are the only lipsticks I wear! My most versatile and longest lasting lipstick so worth the higher price compared to the other lipsticks on this list. Creamy and nourishing too! This is a little bit sheer but still great color. Has a little bit of a purple hue in it. Obviously in the red family but a little more crimson than the true red. In the pink family but really goes well with lots of outfits/colors. I've found this to be a great lipstick when wearing bright orange since I have a good bit of that in my closet... Go Tigers! Of course I am sure many of these lipsticks look great on other complexions too but hopefully this was especially helpful to all the fair skinned girls!! Fair is the new tan right?!? Well at least that's the motto my sunscreen and I are sticking to. Here are a few past style photos for me to identify the lipsticks for you... I usually don't list out my lipstick color in the What I Wore posts so I'll try to add a few photos to this in the future. You can click on the photo if you need to see it enlarged. I had been looking forward to pairing my coral shorts with a chambray top ever since I bought the shorts. We had a few really hot weeks so I had to wait for a day when it wasn't just blazing hot out even though the chambray isn't too heavy. I wore this to dinner out with the girls! I finally ate at Tupelo Honey (a local-ish restaurant with a few locations, the first being in Asheville). It did not disappoint... especially the free biscuits with honey and jam they bring out to every table! If I was saying this to Eric, this is the point where he would quote Futurama and say "free bread at a restaurant". My chambray shirt was a clearance find at Gap for $18 marked down from like $60 something. Probably why I don't own that many things from Gap (as opposed to Gap Outlet) since I won't pay that much for a button down shirt but every so often you find a gem on the sale or clearance rack. I really loved the combo of a chambray top with bright colored shorts. Ever since I purchased this awesome vegetable spiralizer a couple weeks ago, we've been making zoodles like crazy! We've been using them in place of pasta and having them as side dishes and they have been wonderful. I've made zoodles in the past using a special peeler that I have but it just took forever and they weren't very uniform. This spiralizer is so easy to use and clean. Making zoodles is easier and faster than slicing up zucchini and seasoning it to roast or cook on the stove. Eric really likes zucchini and has been requesting and making zoodles too. It is quickly becoming my favorite kitchen gadget and for $35 there is no reason not to own one. I'm excited to try out other vegetables and such too. If you don't own one you should check it out. I promise I'm not a spokesperson for this spiralizer, it just really is that great. The spiralizer only has a few pieces and is easy to assemble. You screw the prongs and handle together into the sliding plate piece that goes along the bottom. An put in your small spiraling blade plastic plate (there are 3 different blade plates it comes with). Of course it comes with instructions but you can easily figure it out from the photo too. Chop off the top of your zucchini and affix that end to the prongs and the end of the zucchini into the small metal ring on the blade plate end. Then you just turn the handle and it will start turning the zucchini through the blade plate to make your spirals. I place a cutting board or something at that end to catch the spirals. When you are only left with about 1/2 inch of zucchini attached to the prongs it won't spiral any more zucchini and you just pull that part back out which also pulls out the "core" from where you attached the zucchini end to the metal ring. Repeat this with the 2nd zucchini. And then you have your zucchini spirals! See that simple. Sometimes I'll give them a rough chop since some of the spirals can be quite long. Next heat a skillet over medium heat and add the olive oil and garlic. After about 30 seconds add the zucchini noodles and season with pepper and crushed red pepper if you want spicier noodles. Cook 1 1/2 minutes or longer if you want more tender zoodles. We like ours to not be as tender as regular pasta noodles. Serve and enjoy! So check out the vegetable spiralizer and start making zoodles! It is an easy way to replace carbs with vegetables for anyone who doesn't gravitate toward eating veggies often. I think this would also be a great gift for anyone who loves to cook. Apparently the formula for a summer outfit is white + floral because while wearing both of these outfits, many people commented on how summery I looked. Fresh crisp white and bright floral.. makes sense to me! Summer is my favorite season so while others have been breaking out pumpkins and fall things the past couple of days, I've been hanging onto summer for as long as possible. Luckily living in NC, we should get at least a couple more weeks of summer-like weather. Fingers crossed! This skirt is really comfy and flowy and has pockets which makes me love it even more! Lots of great midi white skirt options for you in the links below.